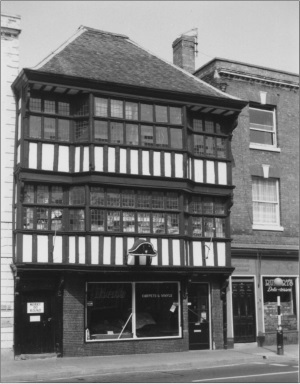 The Hat Shop in Church Street, one of the old houses in Tewkesbury which has often been drawn and photographed, is older than it seems. On the street front it is apparently a later seventeenth century timber-framed building. At the side, over the archway leading to the passage, is carved the date 1664 and three initials: B.K.R. But hidden behind this there is part of a rear wing which is much older, together with the chimney stack. The initials lead to the suggestion that Bartholomew and Katherine Read built the impressive new front in 1664. In 1671 Bartholomew Read was certainly living near the end of Church Street, and he paid tax on two chimneys; not a very large house. One Mr Cooke, not many doors away, paid tax on eleven chimneys, and there were another twenty-six houses with between four and eight chimneys in Church Street alone. When Bartholomew Read died in 1680, his will mentioned his wife Katherine and also his three sons and three daughters, and seems to confirm the guess that B.K.R. relates to this couple. Because of his large family, the property was divided, and remained so for at least the next two hundred years, and his will provides a good insight into the development of an alley in Tewkesbury. The front of the Church Street house, consisting of hall, shop, two chambers and a cockloft and cellar, and a second shop and rooms occupied by Ann Tench, widow, was willed to his wife, Katherine, and then to his son, John. The contents of this part of the house were described by two neighbours, Joseph Sheen, who lived on the opposite side of Church Street, and Thomas Hollis, in order that the executors could obtain probate of Bartholomew Read’s will. The first floor room contained a bed with all its furnishings, tables and chairs, and had a fireplace; the second room appears to have been a living room also, with pots and pans for cooking or keeping food warm, a spit and plenty of pewter dishes, and it also contained a bed and a warming pan. Linen was stored in the small cockloft; sheets, tablecloths, napkins and pillowcases, old blankets and coverlets, and ‘other lumber’, no doubt much like modern cupboards and lofts. Downstairs, the hall was both dining room and kitchen, with table and forms, cupboards and more cooking pots. This room was behind the shop, as is shown by a detail in the will, and was probably part of the older house. The shop had storage boxes, scales, skins for glove-making and forty pairs of ready-made gloves. The unusual wide windows to the first and second floor rooms might have been associated with the trade of their owner, giving light for weaving or spinning, but the inventory shows that in fact the windows lighted the family’s new living rooms. Behind the main house in 1680, Bartholomew Read had a series of small tenements. A kitchen, little buttery, chamber over the hall, malt rooms and two little tenements adjoining the malt rooms, all occupied by Ann Kingsbury and James Holdshippe, were bequeathed to his son, James. It is clear that these rooms are further down the passage, because free access along the Alley or Court was particularly mentioned. The daughter, Hester, inherited three more tenements adjoining the others, one occupied by Stephen Tench who witnessed the will, and with similar freedom to pass along the alley. Hester was also given the stable, pigscote, lime pits and court leading to Poulton’s Lane, and the workhouse and garden reaching to the Avon. All the tenants ‘that shall inhabit or dwell in the said Alley’ were to have the use of the pump in the backside. Poulton’s Lane leads from Church Street towards the Mill Avon, and there is still a door in the back of the Hat Shop premises which would have given the Reads access to their workshop on the other side of the lane. Bartholomew Read was a glover. 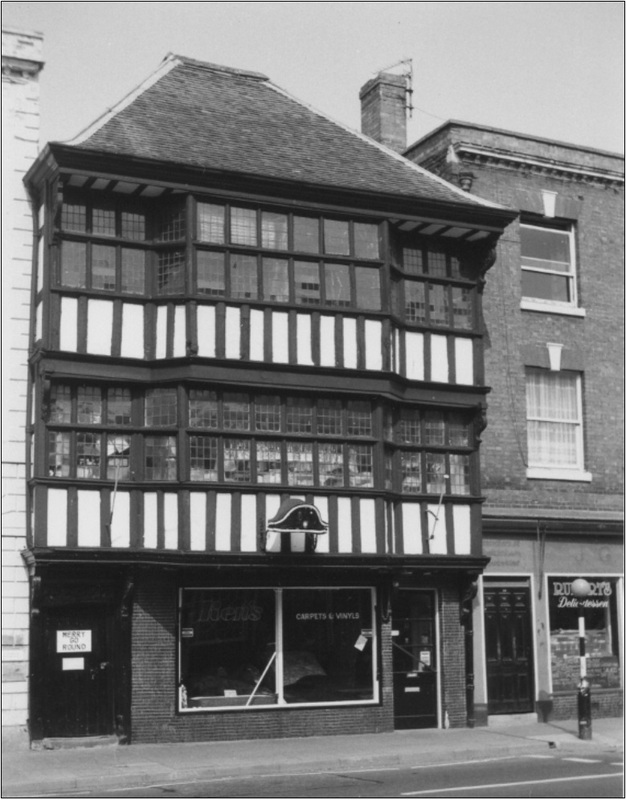 He had served an apprenticeship to John James, glover, and so was entitled to become a freeman of Tewkesbury, allowing him to sell his goods in the town without paying a toll, and to become a town councillor. He was admitted as a freeman in 1649, and could have been the son of Thomas Read, a haberdasher in Church Street in 1608. His political and religious views were probably rather radical, because in 1662, after Charles II was restored, he was removed from the Council, as were other Civil War politicians. Among the sample of wills and inventories recently examined by the History Class meeting at the Library was Hester Read’s, made in February 1694. It was fascinating to find her willing to her brother John the stable, pigscote and limepits, and to her sisters, Elizabeth and Mary, the garden and house standing on it. More puzzling at first was the inventory, which showed that despite owning property Hester Read possessed only her clothes, a little ready money, a silver taster and a silver spoon. Presumably she lived at home with her brother in what had been her parents’ house. Her property rights had ensured that she could not be turned out nor be without a nominal income. Samuel Read died in 1743 and his brother John one year later. Samuel left his daughter a house in Church Street ‘in an Alley there called Mr. Read’s Alley’. He also left her all his pictures. John left his nephew Samuel, son of his dead brother, the house where he lived and another part of the house with stable and brewhouse occupied by one Francis Glover. Samuel’s daughter received silver spoons and taster, and his son James more of the Church Street house and the garden by Avon side. John’s shop goods, as breeches, gloves and skins, and also bricks and tiles, were sold, and the money was divided between his nephews. In the mid-nineteenth century, the house was called the Old Hat Warehouse, and Mr. Read’s Alley was Bank Alley, as a branch of the Gloucestershire Banking Company occupied the building next door. The name ‘Bank Alley’ may be seen just inside the carved doorway. The alley was one of the more insanitary and decrepit. The Tewkesbury Register reported on the ‘uninhabitable state of the houses’ in 1878, then occupied by five men and owned by five different people. This could only refer to part of Bank Alley as, according to the census in 1881, there were twelve households altogether living there, comprising thirty-six people, while a further three ‘houses’ were said to be empty. Joseph Williams, next to the Old Hat Shop, was a draper and tailor, employing six men. He later occupied the Old Hat Shop as well. Kelly’s Directory describes him more expansively as a ‘linen and woollen draper, silk mercer, undertaker, hosier, glover, shirtmaker, tailor and hatter’. It is interesting to find gloving amongst the trades still associated with the Old Hat Shop. Several of the men and women in the Alley probably made and sold goods to Joseph Williams; amongst them were a collar-maker, two stocking-knitters, a ‘stocking flower’ and a sewing machinist. The Bank Manager lived next door to this teeming Alley. In the mid-nineteenth century George Rowe of Cheltenham drew and published a series of six pictures of Tewkesbury’s old houses, of which one was the Old Hat Shop, and towards the end of the century George Moore wrote a paper on Tewkesbury’s Old Houses, and took members of the Bristol and Gloucestershire Archaeological Society on a tour to see them. The Old Hat Warehouse was included in his list of the most notable, and has continued to attract attention since then. 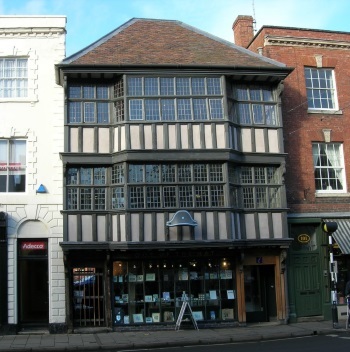 Since 2012, the Old Hat Shop has been in good condition, having been beautifully restored by Tewkesbury Borough Council and now houses Tewkesbury's Information and Heretage Centre 'Out of the Hat'.